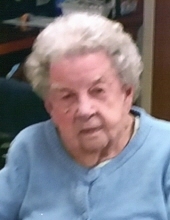 Bertha R. Seibert, 95, of the Church of God Home, Carlisle, and formerly of Shiremanstown, died Thursday, April 4, 2019 at the home. She retired as a bookkeeper for the former Johnson Whiteprint, Camp Hill, was a member of St. John Ev. Lutheran Church, Shiremanstown, and enjoyed doing Word Find puzzles. Born on April 3, 1924, in Duncannon, she was the daughter of the late Russel and Bertha (Belton) Kiner. Mrs. Seibert was the widow of Alton W. Seibert and was also preceded in death by a son, Dennis E. Seibert, a brother, Russel Kiner, and two sisters, Lillian Straw and Fern Freeman. Surviving are two sons, Larry W. (Elaine) of Etters, Russel L. (Debra) of New Cumberland; a daughter-in-law, Kathy Seibert of Mechanicsburg; thirteen grandchildren; twelve great grandchildren. Funeral services will be held at 11 AM on Wednesday at St. John Ev. Lutheran Church, Shiremanstown, with the Rev. Sarah M. Keilholtz officiating. Burial will be in Rolling Green Memorial Park, Lower Allen Twp. Viewing will be held one hour prior to the services in the church. In lieu of flowers, memorial contributions are respectfully requested to St. John Ev. Lutheran Church, (http://www.stjohns1787.org/) 44 W Main St. Shiremanstown, PA 17011. For more information or to send messages of condolence, please visit www.parthemore.com. To send flowers or a remembrance gift to the family of Bertha R. Seibert, please visit our Tribute Store. "Email Address" would like to share the life celebration of Bertha R. Seibert. Click on the "link" to go to share a favorite memory or leave a condolence message for the family.